Audi unveiled a redesigned fourth-generation version of its flagship large sedan in conjunction with the 2017 Los Angeles Auto Show. 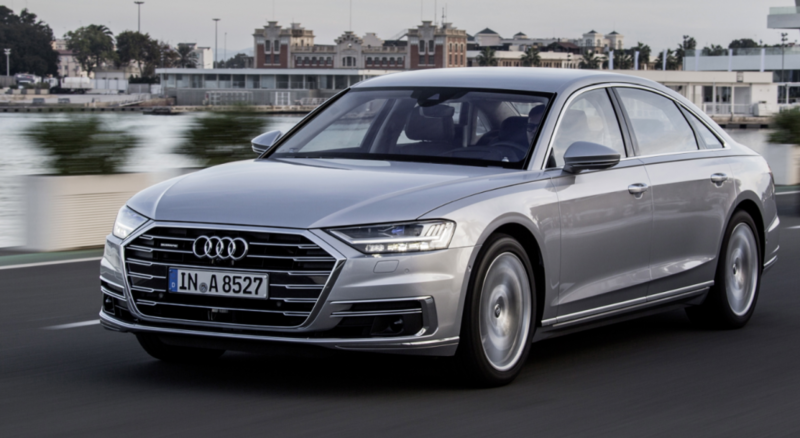 The 2019 Audi A8 represents an evolution of the brand’s design language and debuts with a host of all-new technology features. 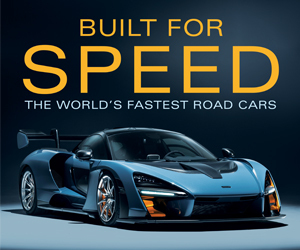 The body structure is 58 percent aluminum, and also utilizes carbon-fiber reinforced polymer components. Audi says the structure is dramatically stronger and more rigid than the outgoing model. The A8 launches with a new 3.0-liter turbocharged V6 engine paired with a 48-volt electric mild-hybrid drivetrain and an 8-speed automatic transmission. Quattro all-wheel drive is standard, as is all-wheel steering and an electromechanical adaptive suspension. Inside is a next-generation MMI system that moves away from the previous MMI system’s rotary/push-button control in favor of a smartphone-like 10.1-inch touchscreen display that offers customizable audible and haptic feedback. Available features include a head-up display and a Wi-Fi hotspot for up to eight passenger devices. The rear-seat area can be outfitted with Matrix LED reading lights, as well as reclining rear seats with heated massage functions, footrests, center heated console and arm rests, and a rear-seat entertainment system with two Audi tablets and a detachable rear-seat remote. An extensive roster of driver-assistance features includes an intersection-assist system that helps reduce the possibility of a collision with crossing traffic, a park-assist system that automatically parks the vehicle in parallel or perpendicular parking spots, a maneuver assist system that provides steering inputs and braking in close-quarters areas such as parking lots and garages, and a curb warning feature that uses mirror-mounted cameras and sensors to help avoid wheel-scuffing contact with curbs and other hard-to-see obstructions. Audi says the A8’s AI traffic jam pilot system meets the Society of Automotive Engineers definition of Level 3 automated driving; the system is capable of handling acceleration, steering, and braking when certain conditions are met, allowing the driver to take their hands off the wheel until the car requires manual driver control again. Audi says it continues to assess the timing for this feature, and will introduce the system when market readiness allows. So, the exact timeline for the availability of the 2019 A8’s self-driving functions has not been nailed down, but the car itself is set to go on sale in the fall of 2018. Large luxury sedans such as the A8 are typically at the cutting edge of automotive innovation; the latest and greatest technologies usually debut on these cars before trickling down to more affordable vehicles. 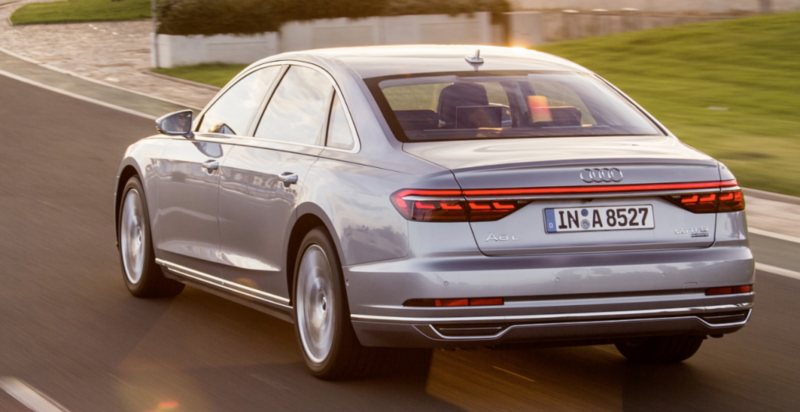 As Audi puts it in the A8’s press release, “The all-new flagship sedan sets the bar for the brand’s pursuits in design, technology, performance, and driver assistance systems to which all future model lines will aim.” The 2019 Audi A8 steps up with an impressive array of new features and advancements on most every front. In addition to the forthcoming semi-autonomous driving functions, we’d expect to see the new A8 line proliferate in the coming years with additional powertrain choices and a new high-performance S8 variant. For now, it appears that Audi is off to a fine start for the future.